Hi there! 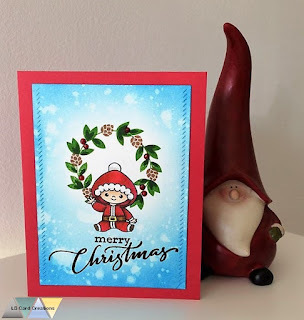 The Christmas Card post No. 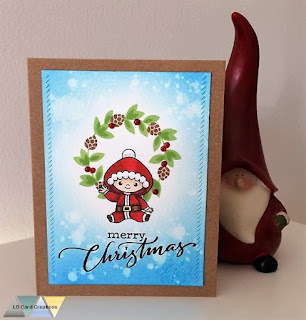 5 is ready :) Today I used the sweet stamps from 'A cookie Christmas' from Mama Elephant. I colored them in with Copic markers and used the coordinating dies. Then I created a cloudy background with MFT stencils and distress inks. I also used the landscape trio dies for the snow. I decided to use a German sentiment for this one. I made two cards at once using different card bases: a green one and a metallic brown one. Hi everyone! 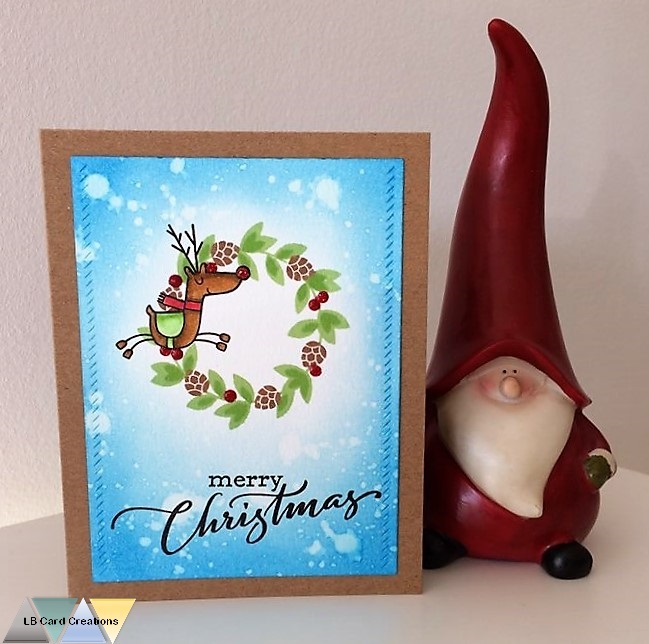 I am back with two cards using the adorable 'all in onesie Christmas' set from Clearly Besotted again. I wanted to make those sweet children my focus point. So I started out by cutting a strip of watercolor paper and stamping 4 of the adorable the images. I used the misti for that so I created two panels at once. I colored the images in with Zig clean color real brush and created masks to cover them before I added distress inks on top. For one card I used green distress inks and for the other blue colors. I also sprinkled some water droplets to create more interest. 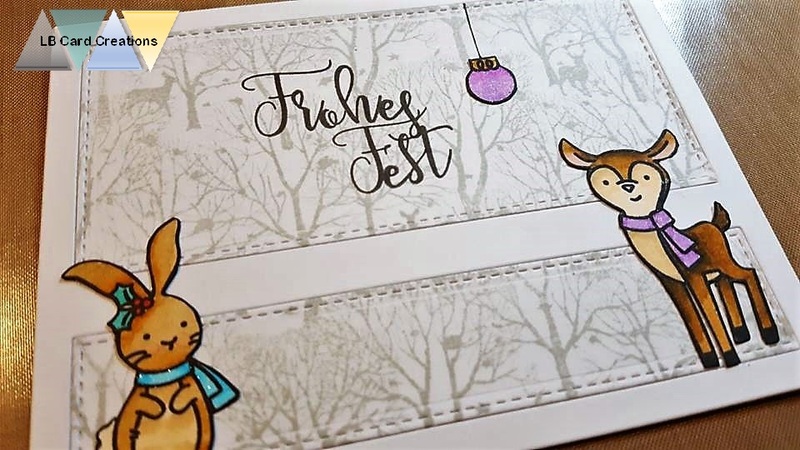 After that I used a new Tim Holtz stencil and candied apple distress oxide inks to add some stripes to a craft cardbase. 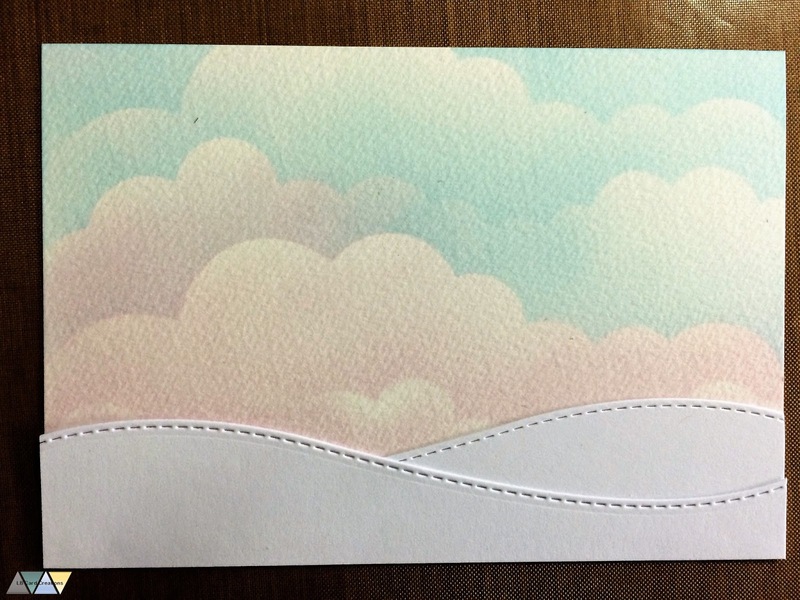 Then I added the colored panels with foam tape to the card base. I didn't want to add a sentiment on the front, so the children remain the stars of this card. I just added a small greeting on the inside. Hi there! 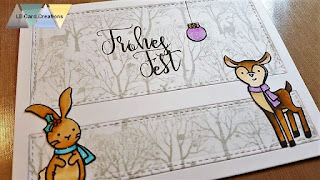 Finally I could play with the sweet new Clearly Besotted stamps :) I am a big fan of their designs especially in combination with Zig clean color real brush markers. 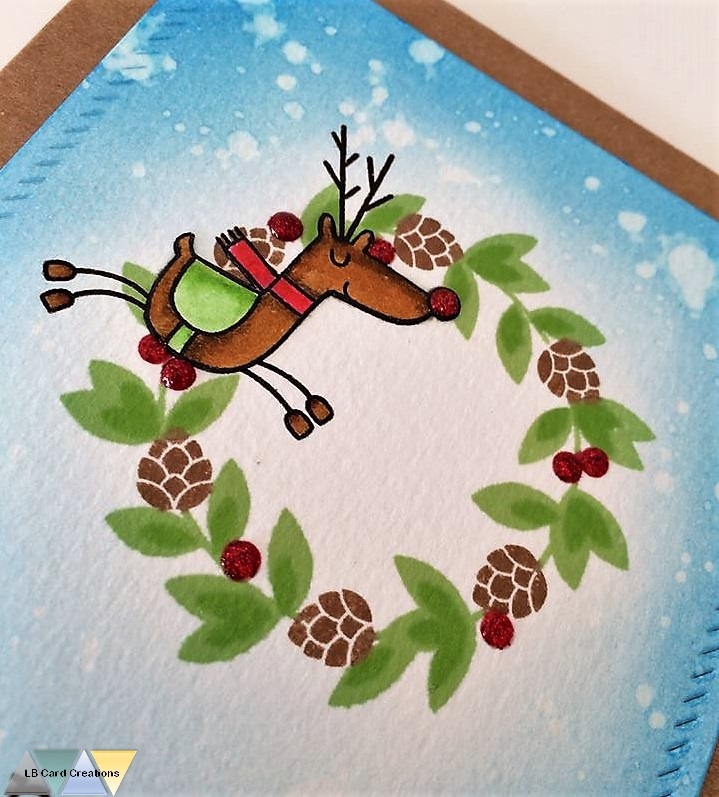 This time I created three cards using the new 'all in onesies Christmas' set and the older sets layered wreath and 'let's prance'. 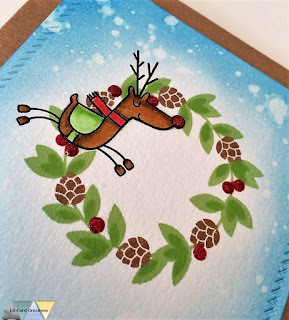 I started out by creating the wreaths using Lawn Fawn ink. Then I used salty ocean distress ink to create kind of a frame around the wreath. I also added water droplets for the lovely distress look. Then I stamped the images with archival jet black and colored them in with Zig clean color real brush markers. I fuzzy cut them and adhered them to the card. For the berries I decided to add red glitter nuvo drops. The sentiment is also from the older set layered wreath. Hello everyone! Clean and simple cards are one of my favorites. 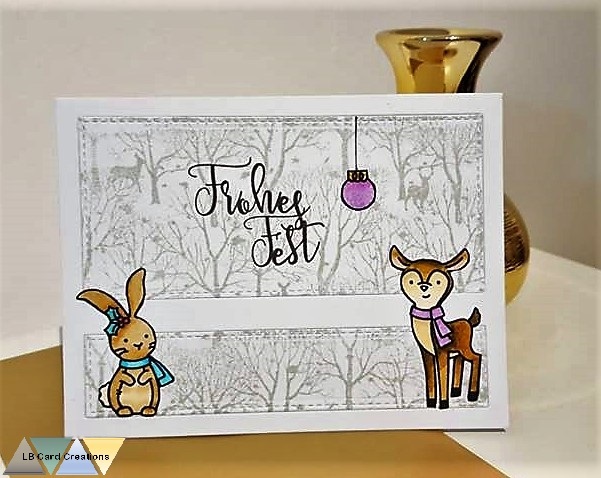 So I created this CAS card for Christmas with the sweet Avery Elle stamps from the set 'Winter Woodland Wonders'. First I stamped a white cardstock with the 'Forest & Deer Bold Prints' in LF manatee dye ink. After that I die cut the piece of stamped paper and another white cardstock with the 'Essential Dover-Up horizontal' die. I adhered the pieces to a white cardbase and then I stamped the sweet images and colored them in with Zig clean color real brush markers. 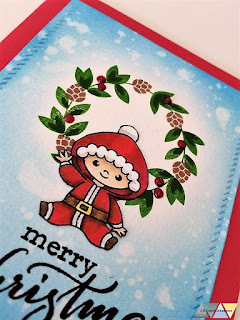 I created the sentiment with the 'calli letters' and 'calli upper letters' which means "happy holidays" in English. Once everything was adhered I used the clear Wink of Stella brush to add shimmer.